I unabashedly love Highlander, and I am not ashamed. Highlander was the first movie I saw as a wee lass to have a lady scientist in it. Brenda Wyatt, the female lead in Highlander, played by Roxanne Heart (and yes, that's her real name) , is a forensic expert employed by the NYPD. Wyatt is also a published author, who has written extensively on swords and other metal work. Wyatt is also the NYPD employee that realizes that "Russel Nash" (AKA CONOR MAcLEOD OF CLAN MAcLEOD) is immortal. Wyatt does so by using handwriting analysis, comparing all of the owner's signatures of "Nash's" house. They all match. 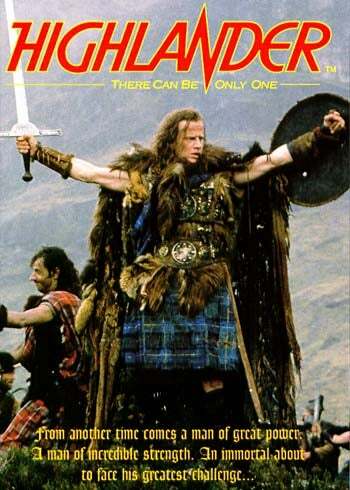 There are other reasons to love Highlander- the rockin' Queen soundtrack, Clancy Brown's incarnation of the villain, Sean Connery playing an Egyptian with a Scottish accent, etc. That being said, as a kid, it was really nice to see a lady be a scientist. I think that I love Scully from The X-Files for the same reason. Are there any movies that society pressures you to be "embarrassed" to like, but you enjoy anyway?